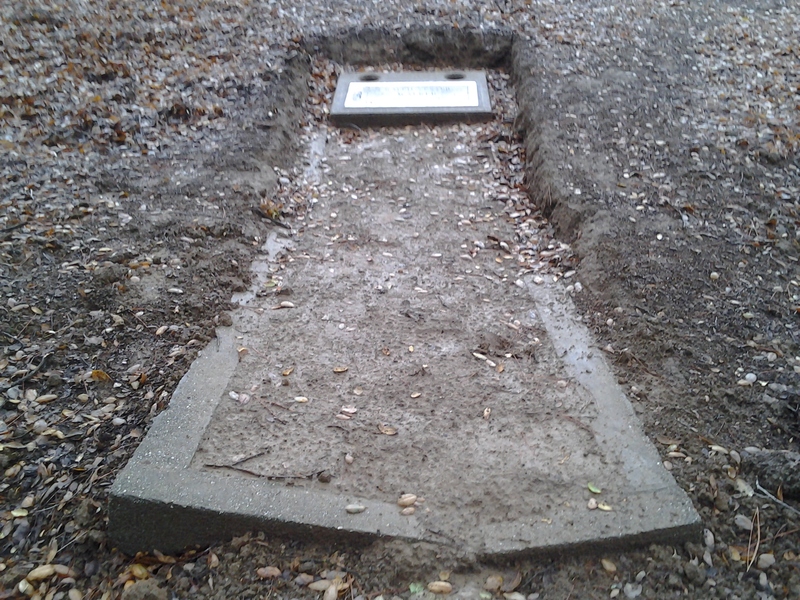 On October 15, 2016, located on the border of Potter’s Field within the Alhambra Cemetery, Ralph Vester Walker’s gravesite was revealed after the removal of approximately 8" of silt. 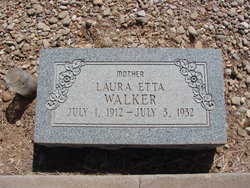 It contained a cement border with a blue marble headstone inserted also in cement. 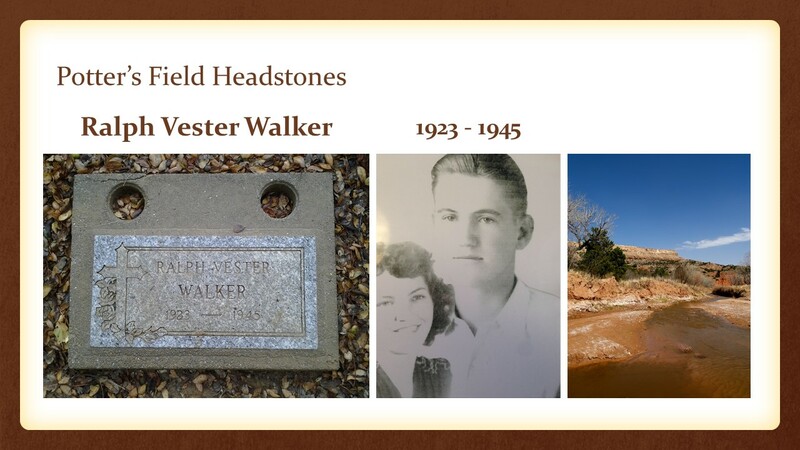 After some considerable investigation and help from descendants we discovered he was born on December 22, 1923 the eighth of twelve children to Bune Vester Walker and Roxie Cordelia Shumate in Red River County, TX. According to his death certificate, Ralph passed away from gross bodily injuries and depressed fracture of his skull when his motorcycle was hit by an automobile in Richmond, CA. He died on July 29, 1945 at 14 minutes passed midnight. He was a young man of 22 years, a husband and a father. Gathered from Bune Vester Walker’s World War I registration card, we learned that Ralph lived his first eight years on his father’s farm in Manchester, Red River County, TX. 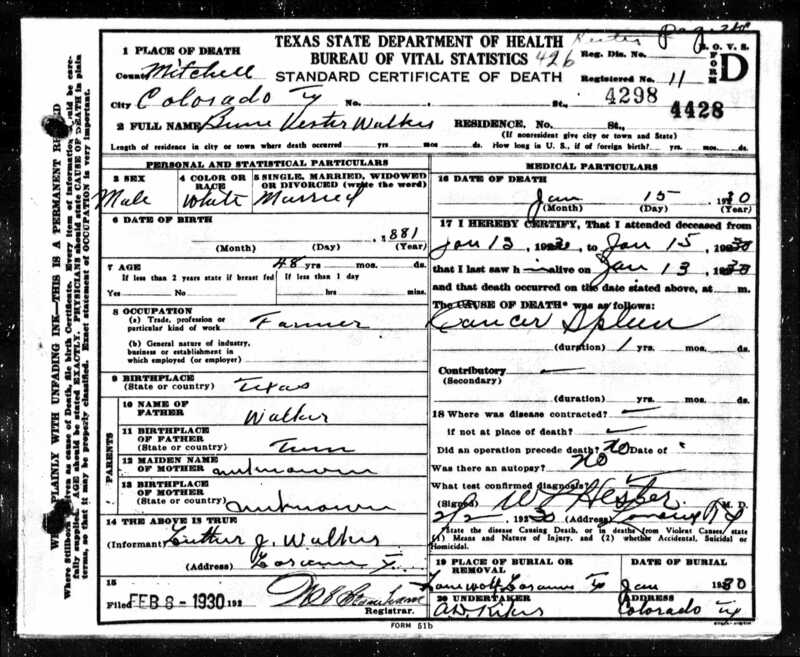 From Texas Death Certificates from 1903-1982, we found that Bune Vester Walker died suddenly from cancer of the spleen on January 15, 1930, in Colorado, Mitchell County, TX. He was survived by his wife Cordelia with 10 children to care for, a year into the Great Depression. 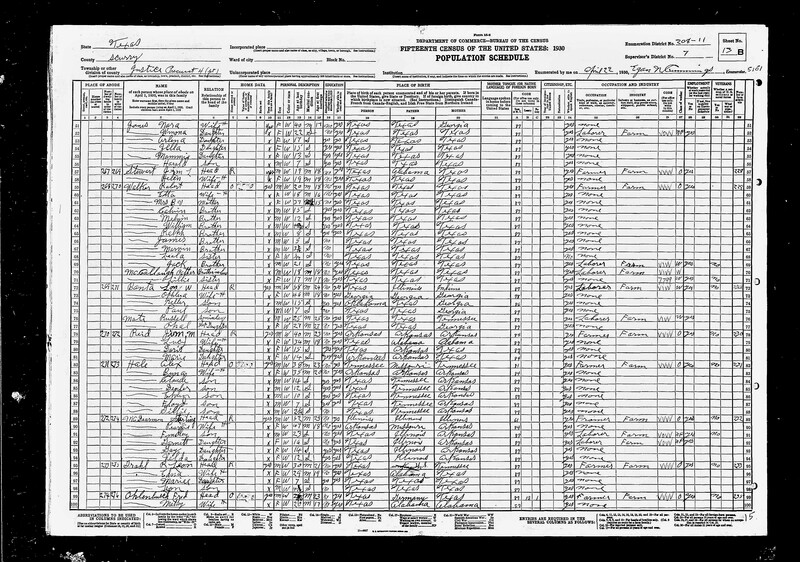 From the US Census of 1930 taken on April 22, we discover Cordelia and her 10 children moved in with her older son Robert Fulton Walker and his wife Laura Etta Walker on their farm in Scurry County, TX. According to the Texas State Historical Association, Scurry County was no better off than Red River County during the Great Depression. 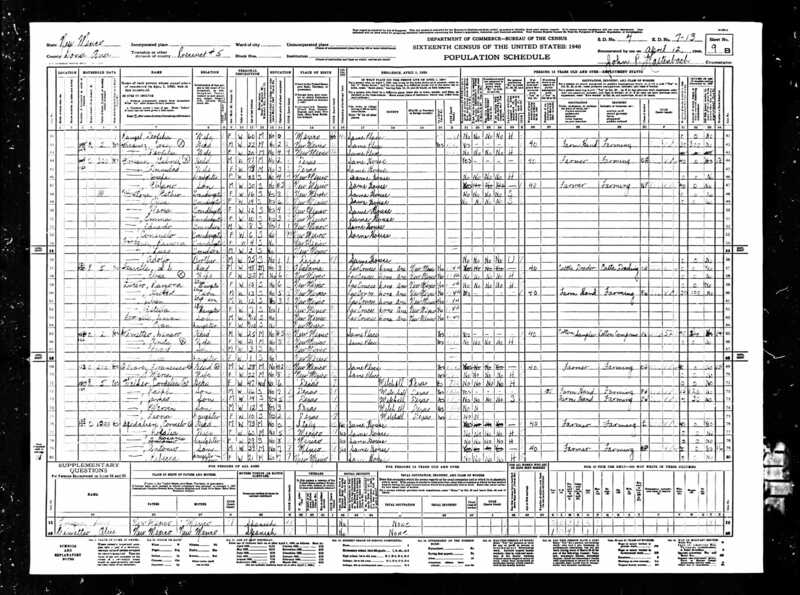 From the US Census of 1940 taken on April 2, we find his brother Robert and wife Evelyn with son Bobby and 2 daughters living in Las Cruces, Dona Ana County, NM. Under the heading Residence April 1 1935, it states "same place". Somewhere between 1932 and 1935 they left TX for NM. According to the Dona Ana County NMGENWEB Project, “...Great Depression. Federal New Deal funds provide employment for many and causes numerous public buildings to be constructed...” would have been one reason that Robert moved to New Mexico. 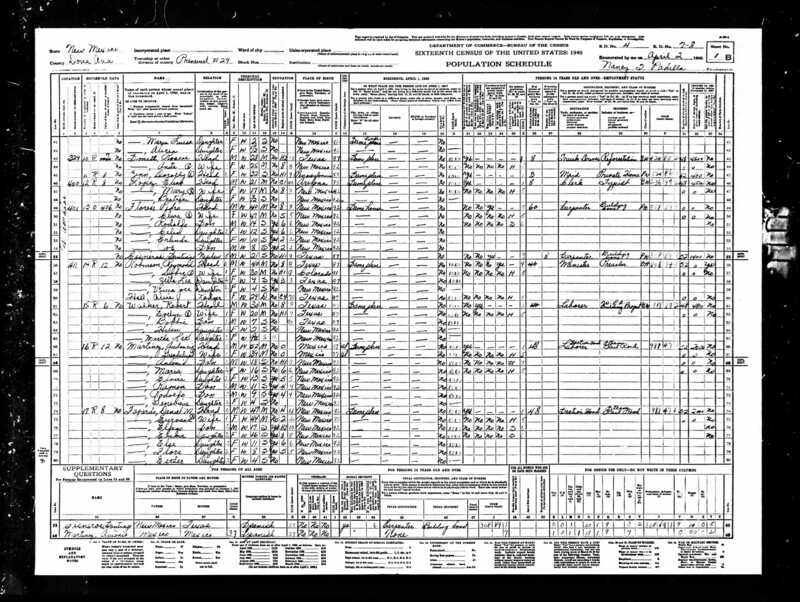 Also from the US Census of 1940 taken on April 12, we find Cordelia with 4 of her children including Ralph living in Mesilla, Dona Ana County, New Mexico. Under the heading Residence April 1 1935, It states they were living in Mitchell County, TX. Somewhere between 1935 and 1940, Ralph’s mother and three of his siblings moved from TX to NM. It also states that Ralph is now 16 and worked 15 hours as a farm hand in 1939, (perhaps in NM). During his life in NM, Ralph married Euvelta Allred (Allreo) at the Dona Ana County Courthouse on October 31, 1942, according to the American History and Genealogy Project of NM. Sometime shortly after their wedding, they moved to Richmond, CA and Euvelta became pregnant. In the Deming Headlight (NM), Euvelta Allred McLaughlin’s obituary (1927-2016) reads, “... during World War II Velta, age 15, and her two teenaged sisters moved to Richmond, CA and worked in the shipyards to support the war effort. She was briefly married to Ralph Walker who was a member of the U.S Coast Guard Merchant Marines...” This means that Ralph and Euvelta would have moved to Richmond, CA, between the months of November 1942 to April of 1943, before her 16th birthday on May 21, 1927. Not only did Euvelta and her sisters work at the infamous Kaiser Shipyards, but according to Luther Jack Walker’s NM, World War II Records, 1941-1945, Luther (Ralph’s older brother) was working at the Kaiser Shipyards at the time of his enlistment in 1944. Luther and his wife, Lucille were living at 1432 Sutter Avenue, Richmond, CA. Unfortunately, they gave birth to a stillborn boy in 1942 who is also buried in the Alhambra Cemetery. Jamie Lynn Barr’s* family recalls Ralph lived in Richmond, CA, while separated from Euvelta but having custody of Dorothy until his death. Euvelta’s obituary reads she gave birth to Dorothy on September 27, 1943 in NM. We may never know the truth of custody, but we do know that the CA, Death Index, 1940-1007 confirms that Ralph died in Contra Costa County, CA on July 29, 1945. We also know that Euvelta married William McLaughlin in NM in 1946 and had custody of Dorothy at that time. In order to verify Jamie’s information, we were able to tract down Euvelta and Dorothy from Find-A-Grave, the US, Cemetery and Funeral Home Collection 1847-2016, and the obituaries of Euvelta Isetta Allred McLaughlin and Dorothy Velta Walker Huffstutler. In the McCoy Funeral Home’s obituary website, Dorothy’s obituary states that she is born on September 27, 1943 in NM. We know that Ralph was in the U.S. Coast Guard Merchant Marines and we know that Euvelta was in Richmond, CA, at the Kaiser Shipyards at the age of 15 (May 21, 1942 to May 21, 1943). This still leaves us with the question as to how Ralph had custody until 1945 and whether it was in NM or CA. Euvelta Walker McLaughlin died on October 23, 2016 in Salem, NM, eight days after we discovered Ralph’s gravesite. According to Ralph's death certificate, He was living at 1432 Sutter Street in San Pablo, CA, at the time of his death. His brother, Marvin, was also living at that address. He was still a seaman in the U.S. Merchant Marines. His body was taken to the Wilson & Kratzer Funeral home in Richmond, CA, and then buried in the Alhambra Cemetery on August 3, 1945. Ralph had lived in the state of California for three years.